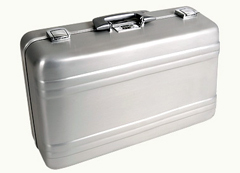 The ZERO Halliburton 100X Series of cases are available in 26 standard sizes. Constructed of durable aluminum alloy, you can choose from either a clear silver anodized or a textured black powder paint finish. Each style comes equipped with a triple digit combination lock and fixed hinge. Foam packs are available. Foam Cushion Sets – Choose from a blank layered cushion set (all models) or a diced layered cushion set (available for case numbers 100X, 102X, 103X, 105X, 106X and 110X only). Each cushioning set is made of a gray two-pound density polyurethane foam. Caster Kit – Available only on case numbers 109X, 110X, and 129X. *Non-stock Onyx items which may require additional lead time - please contact our sales office for delivery. ** Non-stock item. Available in Onyx only.